I can’t believe that I’m already at the end of my first trimester. Thankfully I skipped over the whole morning sickness part, which unfortunately seems to plague many women. And honestly, I’m one of those people who has always been somewhat worried about being pregnant. That’s why, after some careful consideration, I finally decided to share the progression of my pregnancy. My hope is that other women may use the experiences I provide, to help them with their own pregnancy either now, or in the future. Keep in mind though, that every pregnancy is different and just because I can do something, doesn’t mean you should, without consulting your physician. How far along: 13 weeks, 1 day. 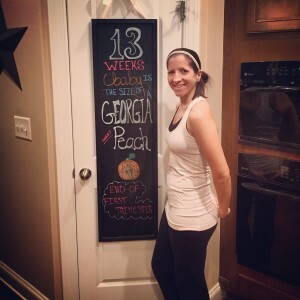 Maternity Clothes: I have not yet needed to go out and buy, or wear, any maternity clothes. With that being said, my pants are finally beginning to feel a little snug, but more so in the afternoon and evenings when I start to feel a little bloated. The great thing about being a personal trainer though, is that I have a ton of yoga pants (I LOVE yoga pants) and shorts. I must admit that I’m very lucky because my work outfits are quite comfy! I do however want to invest in a Bella band, and will probably end up ordering one from Amazon this weekend. I know that I really don’t need it quite yet, but I figure that it will be nice to have on hand for when I do. Miss Anything: I’m currently missing my energy levels for working out. I use to get up at 4:20 a.m. everyday and go to the gym for an hour of high intensity interval and circuit training. Ever since I became pregnant that has not been happening and I’ve actually been sleeping in until about 7:00. I can’t wait for the day that I get that energy back! 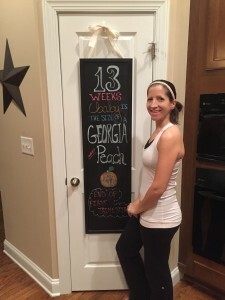 Movement: I’ve not felt any movement as of yet, but every time I’ve had an ultrasound (at least 3 by now) the baby is moving about like crazy, therefore I’m sure it’s only a matter of time. Food cravings: I really haven’t had any strong food cravings so far this week, other than fruit. I absolutely love eating fruit! Mostly because I’ve been struggling to drink enough water like I know I should, and when I eat grapes, watermelon, pineapple, etc. I know I’m getting some of that much needed liquid. What’s Next: This weekend Jeff and I are going to try to do a little bit to the nursery. We don’t know yet if baby King is a boy or a girl, but we have our prediction. Therefore we’re not actually painting or decorating, but I had this idea for the nursery ceiling. I started a board on Pinterest and found this nursery that had the ceiling covered in what looked like whitewashed barnyard wood. I really liked it, so we looked up directions and found out that it was actually just wallpaper designed to look like wood. We ended up purchasing it, and plan to attach it this weekend. I’ll keep you posted on how it goes. Aw, this was a really nice post. Spending some time and actual effort to produce a really good article… but what can I say… I hesitate a lot and never seem to get nearly anything done.